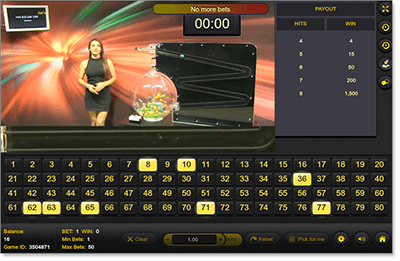 As a lottery-style game, Keno is based purely on luck and the odds of taking out a big win are incredibly low. It’s said your chances of winning a Keno jackpot are the same as winning your state lottery, or in other words, slim to nil. Keno creates winners by the random luck of the draw and the outcome of the game is completely out of player’s control. While many hopeful gamblers believe there are certain strategies that can be engaged to increase their odds of a Keno win, the bottom line is it all comes down to the gods of chance. So with that in mind, is keno a sucker’s game? Is it even worth playing keno if the odds are so intensely against us? Despite its high volatility, real money players shouldn’t be too put off as there are some big bucks to be won in Keno. The odds may be a lot worse than other casino games, but the jackpots are much more life changing. We all know the old adage that high risks equal high rewards, which is an incredibly appropriate sentiment in this game. Understanding how the game works and the associated odds will help give a better insight into what your actual chances are of winning in keno and how to gamble responsibly with this in mind. In Keno, each game will specify how many numbers players are allowed to choose, which is usually capped at 10, but sometimes at 15 or 20. Players select their desired amount of numbers from one to 80 before the croupier or RNG draws 20 numbers at random with the hope that they will match the ones selected by the player. Each keno game has a different pay scale, with different winning values for the amount of matching numbers drawn. Despite some unfounded arguments that suggest certain numbers carry higher chances of being drawn, each number strictly has a one in 80 chance of being drawn, making the house edge in keno the highest house edge in online gambling. The house edge in online Keno varies from venue to venue. Typically the online keno house edge can range from 4% to over 35%, with the average house edge falling round the 30% mark. The reason for the high variation in the house edge is that different games have different rules regarding the minimum and maximum number of matches that players can bet on in a keno game. No matter what your personal keno strategy, players should maintain responsible gambling practices when betting for real money in keno as the odds are definitely against you. In fact, there has been no record of a real money gambler ever winning all 20 numbers in online keno, which isn’t surprising considering the odds of a 20 number jackpot have been calculated at a whopping one in 3.5 quintillion. Based on this table, it’s easy to see that the odds are against you in keno, especially when comparing to another game of luck like roulette where betting or black or red brings odds of 46%. So what can you do to improve your odds at keno? This is a heavily debated subject as many strategists believe the best way to increase your odds is to play as many numbers as possible, where others believe the exact opposite, that placing a bet on fewer numbers actually leaves you in a better position. The downside to selecting as many numbers as possible is that it becomes harder to match them all. If you refer to the list of odds above, you have a one in three chance of landing one number, but increase that to two and your odds diminish hugely. In saying that, each online keno game costs the same amount whether you bet on two numbers or 10 so you might as well bet on as many numbers as possible to increase your chances of getting a match on at least one of them. The verdict understood by the Internet’s leading gambling strategists is that when it comes to keno, there can ultimately be no strategy beyond where you play and how much money you bet. Despite all tactical opinions, keno is a game of luck that requires zero player skill. Winning numbers are drawn at random and results can’t be altered in any way. Your best bet when playing online keno is making sure you play at a reputable gambling venue, bet within your means and simply pray for a miracle. When playing keno for real money simply taking into account that the house edge is high while the chances of taking the jackpot are low will improve your keno experience as you can enjoy the game for the exciting turn of luck that it is without expecting to become an instant millionaire. International players can play online Keno for real money bets at recommended sites like All Slots Casino and G’day Casino with deposit and withdrawals available in multiple currencies.